The World Needs A Stronger Blog...: Weeeeoooooooooh Lookie there Billy Lee! Weeeeoooooooooh Lookie there Billy Lee! Us here Northerners be forgiven for knowing little about the fastest growing sport in the United States. NASCAR – the National Association for Stock Car Auto Racing – was founded in 1948 by Bill France. Several years later, he founded the International Speedway Corporation, which owns the racetracks. In the 1970's, R.J. Reynolds tobacco became NASCAR's lead sponsor, and the Daytona 500 became the first nationally televised stock car race. Still a family-owned business, NASCAR has annual revenues in the billions and is regularly cited as the fastest growing spectator sport in the United States. Yes, but no one cares about NASCAR in New York City. Let's not mince words; everyone knows NASCAR is a redneck thing; a Southeast thing. Don't get all PC with me about NASCAR now. People care about NASCAR below the Mason-Dixie line, not on Madison Avenue. That much has not changed; there's a reason that proposed 80,000 seat NASCAR arena in Staten Island never broke ground a few years ago. Regardless, today was motherfuckin' NASCAR victory lap day in our fair city. NASCAR is basically a form of motorized professional wrestling and having NASCAR in town celebrating the end of their season with "Champions Week", complete with a goddamn "victory lap" in Midtown Manhattan is akin to having the Yankees World Series ticker tape parade in Munich. Naturally I would suppose they have this NASCAR thing in the city as a tourist attraction. Gotta entertain them there tourists. Gotta make 'em feel at home even when they're on vacation somewheres difrent. "That there looks like a good ole smokin' crack up, dunnit Jesse?" The only reason I even know this went on today was because I was stuck in the collateral damage traffic; gridlocked on Madison for a good 25 minutes. NASCAR's victory lap couldn't have come at a better time for the city as today is a classic "gridlock alert day" because of the tree lighting tonight. But I'll be at the tree lighting as a guest of a V.I.P. J.Crew model I know so HOLLA AT YOUR BOY! 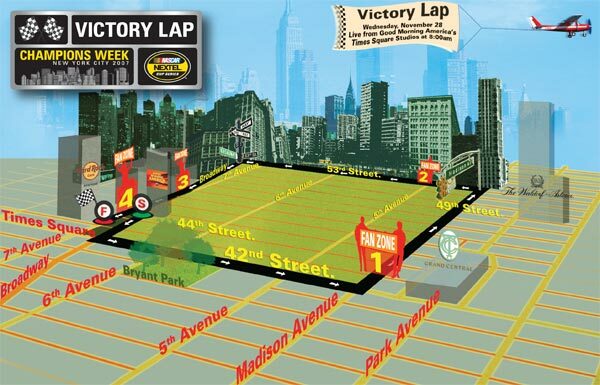 Oooh wait, now I'm hearing Thursday and Friday there will be a NASCAR "Fan Fest" at the Hard Rock Cafe in Times Square. Apparently the festivities finish up Friday night with an awards ceremony at the Waldorf-Astoria, where the NASCAR NEXTEL Cup Champion will be crowned. Ummm... why would all this NASCAR ish take place down South but then when it's time to crown the coveted "NASCAR NEXTEL Cup Champion" you bring the circus to the Waldorf ?!! New Yorkers are thrilled... or did they bus these clowns in from South Carolina?